The Biblical Wild is an interactive Bible study for individuals, small groups, neighborhoods, and congregations where we will journey into the wilds of Holy Scripture through daily readings of the Old Testament and Psalms and weekly video reflections presented by the Rt. Rev. Todd Ousley, Bishop of the Episcopal Diocese of Eastern Michigan. You can follow the program on your own or in a group. Book of Common Prayer Online. An online version of the 1979 Prayer Book that can be browsed with your web browser. To view the Catachism, which is a basic statement of Episcopal beliefs, click here. The Lectionary Page. A helpful liturgical calendar with links to the lessons from the Revised Common Lectionary (RCL), which we use in our services. Click here to learn more about what a lectionary is, how it’s used, and why the Episcopal Church uses the RCL. Daily Office. Each day’s Daily Office (guide for individual prayer and worship) is presented on this web site. Just check the web site each day for the Office for that day. The Daily Office. The Daily Office is presented by the Mission of St. Claire on this web site in various formats for your personal devotions. The formats include downloadable versions for handheld personal information devices. e-Sword Bible Program. Wonderful FREE Bible program with many addon modules available. Forward Movement. Publisher of the Day by Day devotional and many other useful Episcopalian publications. Oremus. A site with many Angican resources including a searchable hymnal and an especially good Bible search tool. To access the Oremus NRSV search tool, click here. To access the Oremus hymn resource, click here. Bible Gateway. One of the best Bible search engines for versions other than the NRSV, plus a wealth of Bible study tools. reJesus. A wonderful online experience designed to put you in closer touch with Jesus. Be sure to check out the ‘Spirituality Section’. StudyLight.org. 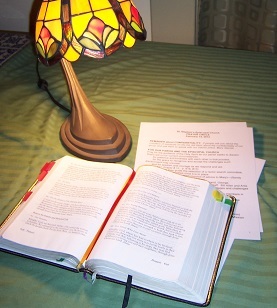 This is an excellent collection of online Bible study resources.